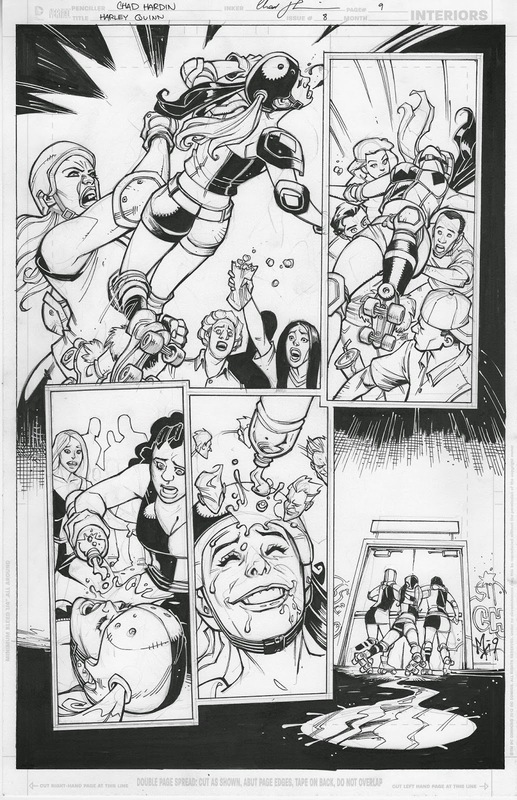 Hardin Art Studios: Original Harley Pages for Sale! Original Harley Pages for Sale! Hey Guys, Original Harley Pages are up for sale on my webstore! Click the Catskill Comic icon in the left hand corner of my blog or visit: http://www.catskillcomics.com/Hardin.htm . Talk to Scott and he'll hook you up. Next month the Harley/Joker wedding pages will be there, so don't get caught with your pants down. Subscribe to his newsletter and be the first in line. Also, if you want commissions, pre-convention commissions, Scott will take care of you. If you ask me I'm going to just give you his email, and number. I need to focus on the book and Scotty let's me do that. Also never pay for an over priced piece of art. I see people flipping my convention art on ebay, charging an arm or a leg DO NOT GET SUCKERED! Come to me and Scott. We won't rip you off and you can get the drawing you want. Kenny, I sent you an email. Thank you for reaching out to me.